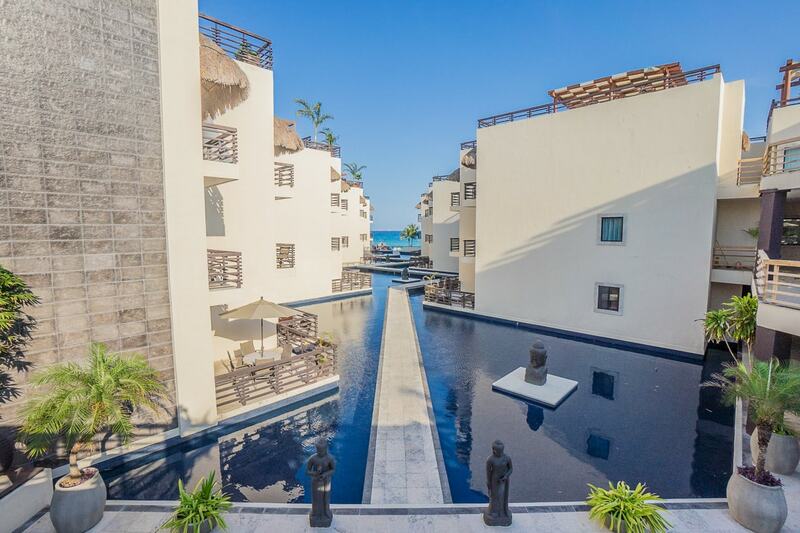 Aldea Thai is one of Playa del Carmen's more upscale condo hotels. Suite 305 features breathtaking ocean views from the living area and main bedroom, a fully-equipped kitchen, a deep soaker tub with rain shower head, marble throughout, and premium toiletries. The master bedroom comes equipped with a king-size bed, plasma TV and safe. The second bedroom, also with its own flat screen TV, accommodates four comfortably. This penthouse also has an exclusive rooftop terrace, with a mesmerizing 180-degree view of Caribbean Sea. Off to the side of the space is a private pool and lounge area as well as a dining table and chairs for eight. The cool vibe of the lounge music inspires a ultra-hip ambiance. The modern design and attractive decor are immediately evident upon entering suite 306, as sleek, dark wood furnishings, granite and marble fixtures are showcased throughout the unit. There is a king-size bed in the master suite, and the second bedroom comes equipped with two double beds. A winding staircase leads to an exclusive, rooftop area, with unobstructed views of Cozumel. A private pool and canopied dining area provide the setting to host friends and family or to enjoy a romantic evening under the stars. This spacious suite with its sleek design and contemporary dark wood furnishings offers guests modern amenities such as marble fixtures, stainless steel appliances and a kitchen replete with all of the conveniences one would expect to find in a luxury condo. Each of the two bedrooms is supplied with high thread-count linens and a flat screen TV. The master bedroom has a king-size bed, DVD player, safe, ironing board and iron. The en-suite bathroom features a deep soaker tub and rain shower head, hair dryer and upscale toiletries.